On long, clear summer nights when the sun sets for only a few hours – and even when it doesn’t at all – crowds of tourists and young people gather at the Linnahall to watch the sunset. The Soviet-era concert hall and sports venue, built for the Moscow 1980 Olympics at the sea’s edge in Estonia’s capital has been abandoned for years and is now popular with urban explorers and graffiti artists. Where once the crowds gathered in the main hall to watch performances, people now sit on the roof above drinking from bottles and cans of beer. On the cracked and broken steps they watch the sun sink into the sea as the fast ferries from Helsinki start and end their journeys at the port below. Across the bay as the waves and sky turn first orange, then pink, purple and finally a deep blue-black, the sun glows next to another of the city’s abandoned relics: Patarei Sea Fortress. Now dilapidated, decaying and empty, the fortress was originally used as an army barracks. 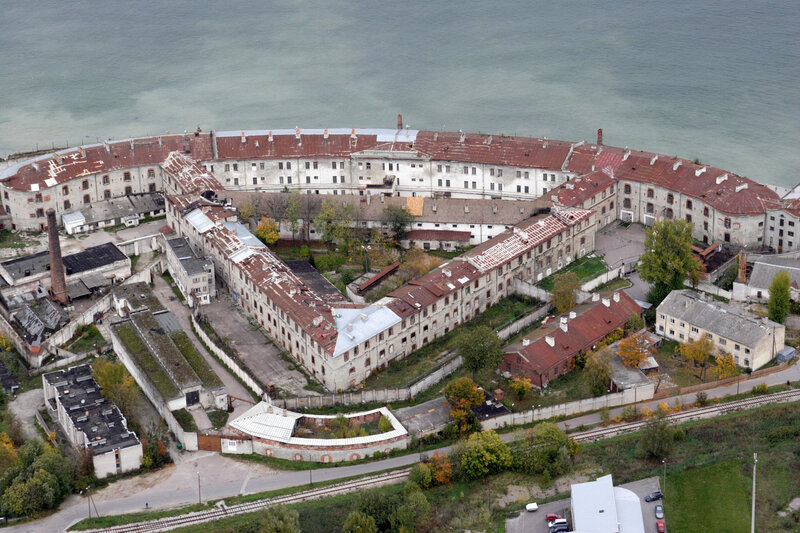 Later it was converted into a prison, taking in prisoners throughout the Soviet and Nazi occupation, when it was one of the most hated and feared places in the country. It finally closed in 2005 after the country joined the European Union. Since then the fortress, in the Kalamaja ‘hipster’ area, has become popular with tourists looking for something unusual to see away from the fairytale-esque medieval Old Town. During the summer months visitors can look around part of the prison, which has become a museum, for a couple of euros. However, there are no signs on the wall offering context or historical information, and no repairs have been made since it closed. Several tour guides offer a ‘behind the scenes’ look at the fortress. But with no upkeep the fortress is in danger of being lost forever says the Estonian Heritage Board. And last year it submitted the complex for the list of Europe Nostra’s 7 Most Endangered 2016. In December it was announced it had secured a position on the shortlist; the winners will be announced later this year. Winning won’t secure the fortress’ future. But it could make it easier to apply for development funding. The heritage board suggested it could eventually be turned into a museum complex, research centre and hotel. Standing in the musty entrance hall, my guide told me that it would take millions of euros to restore the fortress or to tear it down. Then millions more euros to make something on the site. Money that, he said, Estonia doesn’t have. I wanted to find out why it was worth saving and what Estonians think of the place today. When it was built Patarei was the largest strategic building in Estonia and a “superior example of the finest 19th century engineering”. In places the walls are two metres thick, and it is built in two parts in the shape of a sextant and spread over four hectares. The beach front wall is three storeys high. Russian troops moved into the newly built barracks in 1840. It has living quarters, beds for around 1,000 people and a hospital. Until 1918 Patarei served as a military barracks, and after Estonia gained its freedom, the republic’s army took control of the building. Even then it was in a sorry state, affected by damp and mould and “unsuitable for humans”. It was used to store army provisions. In 1920 the government made the decision to turn it into a detention house and then a prison. Tallinn had been without one since the end of WWI and the Russian revolution of 1917 when the previous two prisons had been burnt down. From then on it was used as a prison until 2005. The guidebook, written by museum manager Andrus Villem who has been involved with the fortress museum for more than ten years, says that during this period: “All the major historic events of 20th-century Europe, all the diverse turbulent changes of that century, also washed over Patarei. “Chronologically: the Republic of Estonia 1918-1940, Soviet Occupation 1940-1941, German Occupation 1941-1944, the Second Soviet 1944-1991 and finally re-independent Estonia. At its peak during the occupation in WWII there were close to 5,000 prisoners – five times more than its capacity. In September 1941, 207 Estonian Jews, and many others, were killed in the basement. Around 300 French Jews from convoy 73 leaving Drancy concentration camp were brought to Patarei before being taken on to Klooga work camp in western Estonia. There is a memorial to them outside the fortress. After the end of WWII there was no let up at the prison and Soviet political prisoners, including members of the resistance and the government of the Republic, were interrogated and persecuted there until the end of the 1980s. When Estonia regained its freedom after the collapse of the USSR, the plan was to close the facility as soon as possible, but delays in the building of a new prison meant it stayed open until 2002, although the infirmary did not close until 2005. Now, in January 2016, paint is flaking off the damp and mouldy walls, the floors are uneven and stairs are broken. Objects left by prisoners, such as bunk beds, pillows, bedding, mattress, clothes and medical equipment still litter the rooms and corridors. Occasionally vagrants set up home in the empty cells. Thieves also steal metal. Tourists are told by tour guides not to close doors, as they don’t have keys to all of them. Villem calls it “a ghost town”. It is not easy to describe just how much the fortress dominates the landscape around it or its vast size. But some people are trying. The organisation said the main threat is its rapid deterioration, which it blames on the “harsh climate and lack of maintenance”. The broken roof and windows let snow and rain in, damaging the timber construction beams and limestone walls. The walls are moist and the basement and ground floor “extremely wet”. Several areas are closed for safety reasons. The sea fortress is currently described as a culture park, and the plans for developing it in the future would see the 20,000 square metres of space turned into several museums, galleries and artists’ studios. There could also be a conference centre, tourist accommodation, cafes and restaurants. In the summer there already is a small café that opens on the beach behind the prison. Even in its current state the building is fascinating to tourists, thousands of whom visit each year. The site has been awarded a Certificate of Excellence by review website TripAdvisor. Tour guide Kadi Pilt told Deep Baltic that it attracts those interested in “dark tourism” – seeing places where death and suffering has taken place. She said a lot of people cannot explain why they want to visit, but added its run-down state makes it a big draw for a lot of people. “I warn people in advance that it is not a touristy place, that in fact it is [in] ruins, an abandoned ghost town that is not suited for humans – it never has been,” she said. Pilt said that giving the tours at the start was incredibly draining, retelling the dark history of the place day after day. Gradually she built up a resistance to the stories she was telling, but says she can always see the effect it has on her groups. “I have had people getting really emotional – not just former inmates. There have been three or four times when people had such intense sensory or emotional overload walking around in that place listening to the stories that they have felt physically unwell. There have been men revealing weeks later that they are getting nightmares of that place. Pilt said one of the most fascinating things is speaking to former prisoners and employees of Patarei when they come on her tours. “Sometimes it takes them long time to gather up the courage to see this place again. Gradually they open up, they agree with what I tell or describe and add their own details or stories. “Most of them get lost. They interacted with this place and navigated it differently. So they remember it wrong. As well as the tours occasionally art exhibitions, film shoots and parties take place in the sea fortress. Last August, with the help of the EU, a day-long conference was held in the boilerhouse at the fortress called “Patarei Comes to Life”. In January, a new film of the same name about what the future holds for Patarei was shown in Tallinn. These plans could potentially see the Estonian War Museum moved over to the complex, which would become museums of victims of totalitarian terror and the Cold War. Patarei would also have its own museum established there. At the same time the fortress could evolve into a centre of historical research and awareness, where conferences and workshops would be held. It would be financed through some sort of public-private partnership. Honorary Chairman of the Estonian Heritage Foundation Trivimi Velliste told Deep Baltic the final renovation coasts are likely to be huge. Around 100 million euros “at least”. Speaking in Patarei Comes to Life, Professor David Vseviov of the Estonian Academy of Arts makes the best case for saving the sea fortress. Helen Wright is a freelance journalist working in Estonia. She has written for ERR News, The Baltic Times and Estonian World. Previously she worked at local newspapers in the UK. I go to Tallinn often but haven’t visited Patarei yet. Will do so ASAP, it really is an interesting historical site.